Still in the catacombs beneath the tribal village of Mora, the party continued to explore. They felt they had pinpointed from where the Kopru were operating, but wanted to ensure nothing could sneak up behind them before continuing. Before the part set off to the next chamber, Zhedd spotted a secret door; a loose boulder hidden against the wall of the cave, the clay concealing the edges washed off in the rainwater that trickled in streams down its surface. Krunk hefted the boulder aside, revealing a small chamber containing three emaciated figures behind an iron grille, salvaged from a shipwreck and embedded in the walls as a makeshift prison. The flooding had clearly softened the earth, and as the three undead figures thrashed against the bars reaching long dark talons towards the party, the grille shook precariously. Stefanie called upon Vanya to hold the creatures at bay, whilst the others dispatched them. The passageway south led to two parallel corridors that ran back towards the junction where they had encounters the zombies embedded in the floor and ceiling. From behind a door between these corridors, Antony heard barked commands in a draconic language, which Zhedd and Dacien interpreted as "Quick, stash the goods in a shell - we have company! Get around the back!" Jardek stepped up to kick down the door, as the others watched their flanks. The room beyond appeared to belong to the Sea Turtle clan - large shells adorned the walls and hanged as makeshift braziers from the ceiling. A group of troglodytes stood ready for the attack, their chieftain hurling a trident into Jardek's chest. Krunk stepped in to cleave through the minions whilst Jardek fell bleeding into the water, and Mendel stepped in to cover the dwarf as the others healed him. Once the troglodytes were defeated, the party found their stash of items, and pressed on through the dungeon. Having cleared out the rest of the side rooms, and found a few additional trinkets from the dead interred there and their guardians, the party decided to rest up again, being low on healing for any further battles. Dacien warded the Zombie Master's chamber again and they had a restful night - save for the unearthly howling which shattered the peace in the depth of their slumber. When it was time to move on, Zhedd spotted that the rainwater that had been continually seeping down the walls of the underground complex had ceased. The storm outside appeared to have stopped. The party hurried down the corridor to the underground lagoon. It's waters were still pink with blood, but several of the headless corpses were now gone. The purple mist no longer emerged from the chamber across the water, and daylight could be seen beyond. They started carefully edging along a submerged ledge around the lagoon, when a giant squid burst from the water and started picking Zhedd and Krunk off the ground to drag underwater. A Kopru appeared in the far chamber to investigate the disturbance, only to be met by a fireball from Dacien, which was quickly followed by another as the mage sought to destroy any further kopru that hid in the room beyond. There was a screech as a dark shape descended behind the kopru, who, as all attempts to dominate the will of the party had failed, quickly retreated out of sight. Jardek and Stefanie called upon their immortal patrons to summon Spiritual Weapons against the squid, which was soon dispatched. Antony spotted a chest hidden against the far wall and let his more combat-orientated companions deal with the fight as he examined its contents. Krunk leapt atop the corpse of the squid and Jardek followed using the boots of levitation to pursue the Kopru. Emerging from the chamber was a foul two-headed fiend - it's leering baboon-like faces atop a spindly reptilian frame; a depiction of Demogorgon herself. One head let out a piercing howl as the other gazed around the chamber, it's eyes bending those it saw to its will. A protracted encounter began, as several of the party managed to wound the beast, only to succumb to its charming gaze. Looking to heal its wounds and recover, the creature flew up through a hole in the ceiling that lead to the surface, leaving the party to follow. They hurried to the trapdoor exit to the Zombie Master's hut. Jardek and Zhedd lead the charge - Zhedd hoping to use his powers to ensorcel the elasmosaurus they had seen previously. Just as Zhedd was about to comment to Jardek that the zombie master's hut seemed different somehow, a mob of small shrunken zombies darted out from under the tables and leapt upon them. Their needle-like fingernails dripped a dark ichor, but both they and their venom were fought off. Running out of the hut into daylight, the party saw the elasmosaurus had moved fro matop the central pyramid and was crushing the village to the southern shore. Keen eyes spotted dark wounds on the dinosaur that should have killed or incapacitated it, yet it showed no signs of being hindered as it crushed homes and desperate villagers alike. Noticing its slow lumbering speed on land, the party kept it at range with bows and spells, Mendel's sharp-shooting and customised arrowheads bringing it to a swift end. One of the tribal leaders, Kulkan of the Boar tribe, stepped forward to thank the party for their help, and on the news of the events under the villages, explained the need to quickly bring the other tribal leaders together. They hurried towards the Sea Turtle clan, also to seek out their travelling companions, only to find the villagers there forming a perimeter and barring entry. Avner, Tavey and Thanti were amongst them too - seemingly charmed by the exalted Demogorgon fiend. They informed the party that they must wait until granted an audience, and that Urol and the tribal leader had been killed for disobeying the creature. 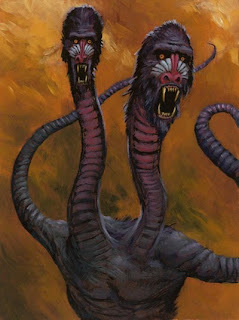 Moments later, the Aspect of Demogorgon strode forward through the huts and demanded a tribute from the party. The only un-charmed members, Krunk led an attack as Zhedd warded Stefanie from the enchantment with a protective spell. Confusion reigned as villagers sought to prevent the party attacking, and magical influence caused the party to loose control of their own actions, but eventually it was brought low. The party were left surrounded by the devastation in the sodden ruins of Mora. Kulkan realised he was the only chieftain left alive from the clans, and no members of the Cult of the Walking Dead remained alive.He thanked the party for their help, offered to have them transported to Farshore when the canoes were repaired, and made plans for rebuilding the village. The party were left amid the ruined village to plan their next steps.